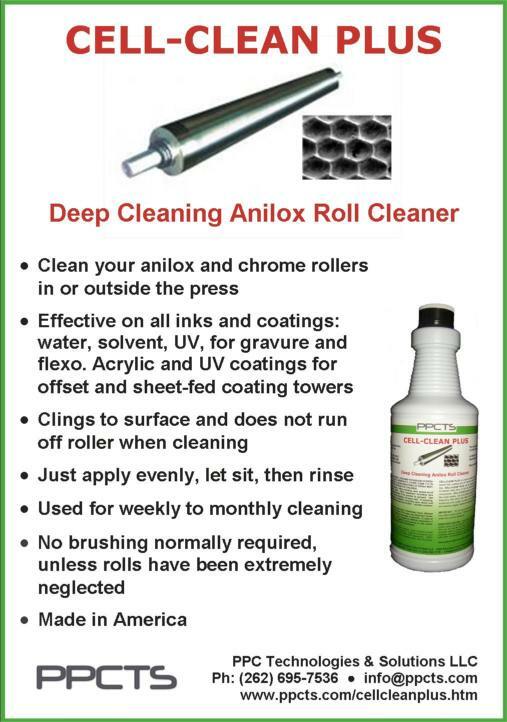 CELL-CLEAN PLUS Deep Cleaning Anilox or Chrome Roller Cleaner by PPCTS is a high efficiency, high viscosity cleaner that clings to the surface of the roller without dripping off. CELL-CLEAN PLUS, is effective on all inks and coatings; water, solvent, UV, for gravure and flexo, as well as acrylics and UV coatings for offset and sheet-fed coating tower anilox rollers. CELL-CLEAN PLUS can be used in or outside the press, is easy to apply with no required heavy brushing, rinses off with water or a damp rag and leaves no residue. CELL-CLEAN PLUS can be used as a weekly or routine cleaner to keep cells open for consistent printing and coating quality. CELL-CLEAN PLUS is made in America.